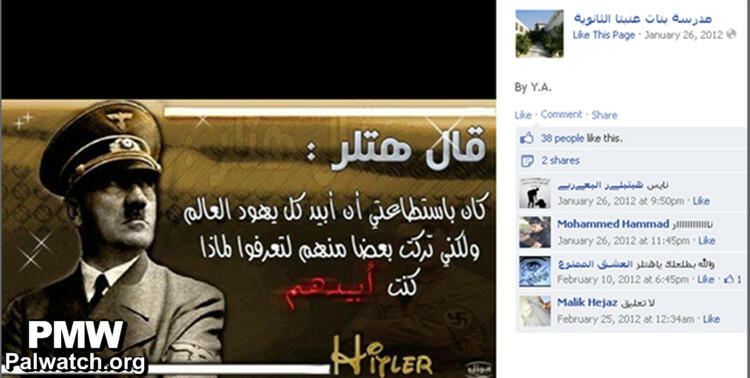 The name Hitler does not carry the stigma in PA society that it does in the West. 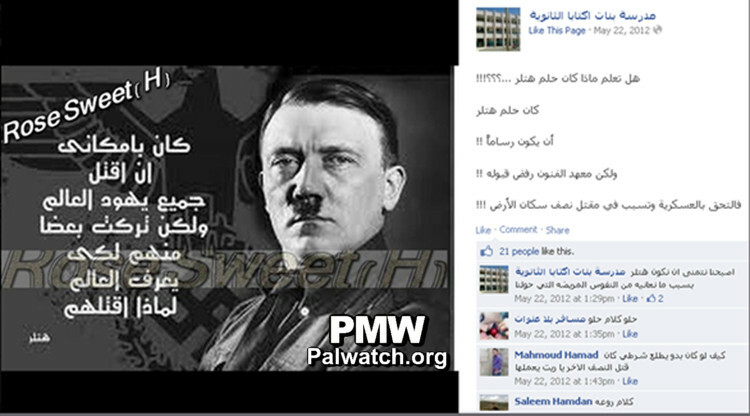 Both the Hamas weekly and the Fatah PA dailies have written in favorable tones about Hitler. To some Palestinians, the man and his name are worthy of admiration. 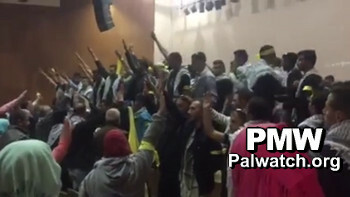 While it may be surprising to Western observers to see official Palestinian sources presenting Hitler in a heroic light, it is important to note that the revulsion of Hitler that is taken for granted in the West is not true of Palestinian society. There are even Palestinians whose first name is “Hitler”: Hitler Salah [Al-Hayat Al-Jadida, Sept. 28, 2005], Hitler Abu-Alrab [Al-Hayat Al-Jadida, Jan. 27, 2005], Hitler Mahmud Abu-Libda [Al-Hayat Al-Jadida, Dec.18, 2000.] 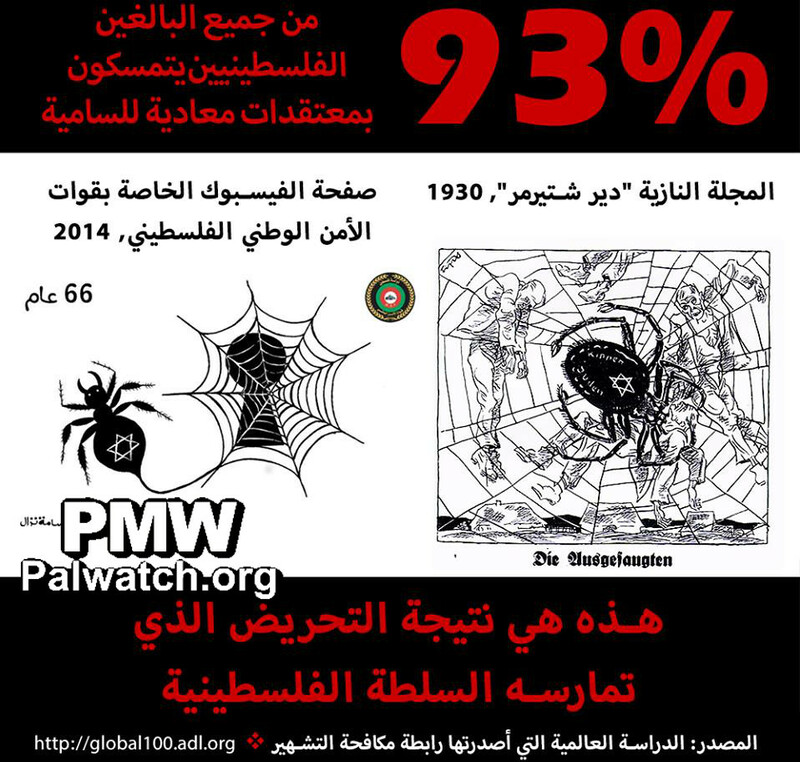 Articles reflecting admiration for Hitler have appeared in both Fatah and Hamas newspapers. A contributing factor to this admiration may be the history of the Hitler-Arab alliance during the Second World War. 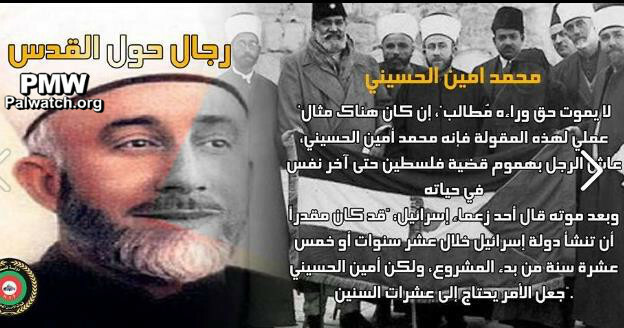 Amin Al-Husseini was the Grand Mufti of Jerusalem at the time of the British Mandate. During World War II he moved to Berlin, where he was a Nazi collaborator and an associate of Hitler. Al-Husseini was on Yugoslavia's list of wanted war criminals, and was responsible for a Muslim SS division that murdered thousands of Serbs and Croats. When the Nazis offered to free some Jewish children, Al-Husseini fought against their release, and as a result, 5000 children were sent to the gas chambers. The picture shows Mufti Haj Amin Al-Husseini. The first two images show students on stage making Nazi-like salute. 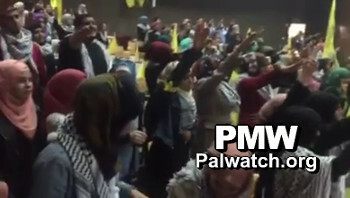 The last two images show the audience of students from Fatah’s Shabiba. 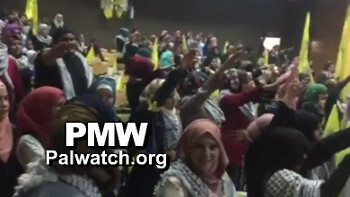 On this issue, National Security Forces ‎spokesman Hafez Al-Rifai said: ‘This step ‎is part of the insane incitement campaign ‎the Israeli government is mounting against ‎the [Palestinian] leadership, in order to ‎dissuade it from continuing to demand the ‎rights of our people and from achieving a ‎just peace.’‎"
This is the result of the PA’s incitement. For more, click "full article." "Don't argue with a fool because people won't be able to tell you apart." "When the defeated smiles, he denies the winner the pleasure of victory." "Don't challenge a man who has nothing to lose." "A man remains a boy until his mother dies. When she dies he suddenly grows old." "If you were stabbed in the back, know that you are in front." "Be a friend, but don't aspire to have a friend." "When you love your enemy, he feels his small worth." "We are all like the moon - we have a dark side." "Don't find fault in your wife's taste for she chose you in the first place." "We love the past because it has gone. 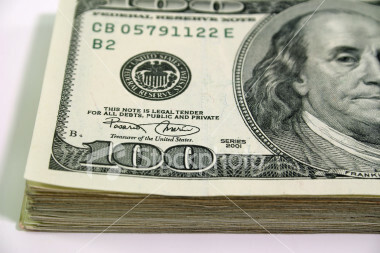 If it should return - (sentence cut off in original)." Note: Zayzafuna's website states that the magazine's advisory board is comprised of Palestinian Authority officials and educators, including Jihad Zakarneh, PA Deputy Minister of Education, and Abd Al-Hakim Abu Jamous, Head of Media Department, PA Ministry of Education. PA daily op-ed lauds Nazism: "Had Hitler won, Nazism would be an honor"
"'History is a great lie written by the victors' - said Napoleon Bonaparte, the source of dubious historical writing and father of Freemasonry in France. If so, is the history planted in us through TV and the standard educational curriculum indeed true? The source of this history is the West - the victor ever since the fall of Andalusia (Muslim Spain)! ...Our history is replete with lies, from lies about the corrupt [Caliph] Harun Al-Rashid, which ignore the sources indicating that he dedicated one year to pilgrimage [to Mecca] and one year to Jihad (i.e., he was a good Muslim), to the lie about Al-Qaeda and the Sept. 11 events, which asserted that Muslim terrorists committed it, and that it was not an internal American action by the Freemasons, which was mentioned in the Illuminati game cards ten years before it took place, and in over 15 Zionist and Freemason Hollywood-produced films in the 1990s. The method of repeating [the lies] over and over has authenticated false facts. Had Hitler won, Nazism would be an honor that people would be competing to belong to, and not a disgrace punishable by law. Churchill and Roosevelt were alcoholics, and in their youth were questioned more than once about brawls they started in bars, while Hitler hated alcohol and was not addicted to it. He used to go to sleep early and wake up early, and was very organized. 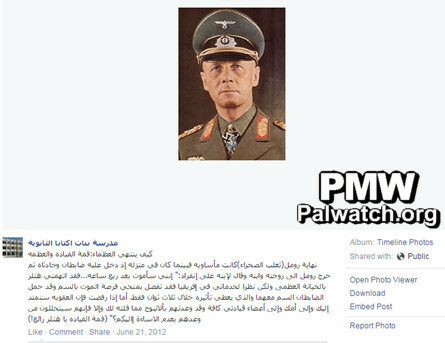 These facts have been turned upside down as well, and Satan has been dressed with angels' wings..."
Iktiba High school posts picture of Rommel with text praising Hitler as "the pinnacle of leadership"
Note: Zayzafuna is a PLO magazine for children funded by the PA. The magazine, which includes material written by both the magazine’s staff and child readers, represents the values of the educators and serves as a window into the minds of the Palestinian children submitting material to the magazine. PMW’s book Deception includes a chapter on Zayzafuna. Following PMW’s exposure of Hitler glorification in the February 2011 issue, UNESCO halted its funding of the magazine. View UNESCO’s statement and PMW's bulletin on the December 2011 issue of the magazine. "His golden year was 1940, when his armies invaded Denmark, Norway, Luxembourg, Holland, and Belgium and defeated France ... By mid 1942, his country controlled the largest land area in Europe… He refused to surrender and continued to fight for two more years, but, his bitter end came in the spring of 1945 when he took his own life…. Who is he?" "Adolf Hitler, while exciting the Germans of the Sudetenland - the Sudetenland is a German province that the Allies had annexed to Czechoslovakia after the First World War - told them in his broadcasts: Look at what the Palestinian revolutionaries are doing to Great Britain!" "Sometimes parents name their children with foreign names, due to the father's admiration for a foreign personality. This is the source of the names Rommel [Nazi General] and Napoleon." "Even Adolf Hitler, who after the fall of Nazi Germany turned into a political horror for most writers and artists, during the last decades has started to reestablish his place in the picture. There are some in Britain who defended Hitler and tried to do justice for him. There are elderly people, among them Arabs, who still carry the name Hitler since their fathers, who were charmed by him, linked them [their children] with his name." Mein Kampf was rated 6th on the best-seller list among Palestinians in a survey conducted and reported in PA daily Al-Hayat Al-Jadida.